Inside each tooth is the pulp which provides nutrients and nerves to the tooth, it runs a thread down through the root. When the pulp is diseased or injured, the pulp tissue dies. If you don’t remove it, your tooth gets infected and you could lose it. You need a dentist trained in endodontics – the branch of dentistry dealing with the root and pulp of teeth. 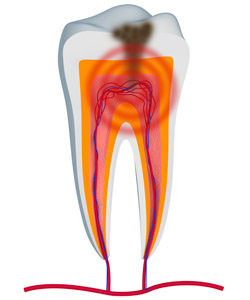 If you’re feeling tooth pain, you may need endodontic treatment. Please give us a call at our Elizabethtown Pennsylvania endodontics office.. A root canal can help alleviate the pain and save the tooth.